Oscar was born by emergency cesarean a week early due to unrelated medical reasons. To most he was a normal baby, but for me as his mum I knew in my heart there was something not quite right. His eye seemed bulgy but I felt guilty telling anyone other than my husband my concerns as it seemed ‘cosmetic’ -to me he was still perfect! As he grew he wasn’t meeting his milestones. He wouldn’t focus on people or objects. He was extremely clingy and would scream until he choked if I put him down or left him alone. He refused to sleep at night and if he did it would only be for an hour or two at most before waking up screaming again. I repeatedly voiced my concerns to the health visitors and doctors, but kept getting reassured ‘all children progress at different speeds’ which I already knew having two older children. Around 7 months Oscar became constipated. He would scream in agony and his whole body would go unbelievably ridged but he still wasn’t able to go. Again visits and phone calls to various health professionals got us no where. When Oscar was about 8 months old I took him to be weighed, whilst there the health visitors realized he wasn’t thriving as he should be. He was under weight, his body was still floppy and they agreed he hadn’t met his milestone so agreed to come for a home assessment. The home visit backed up my fears from birth. He couldn’t focus his eyes, he could not lift his head, roll over or sit. He was then referred to a pediatrician and within 3 days we had a preliminary appointment. He still had all of his primitive reflexes, had failed to gain weight, head lag, undescended testes, bilateral inguinal hernias and his head had stopped growing. Within two days we were referred to Oscar’s present pediatrician We were finally reassured that it wasn’t in our heads and something was wrong with our little boy. The next few years were a whirlwind of hospital appointments, blood tests, x-rays, CT and MRI scans. Alongside Physiotherapy, Occupational therapy and Speech and language appointments. 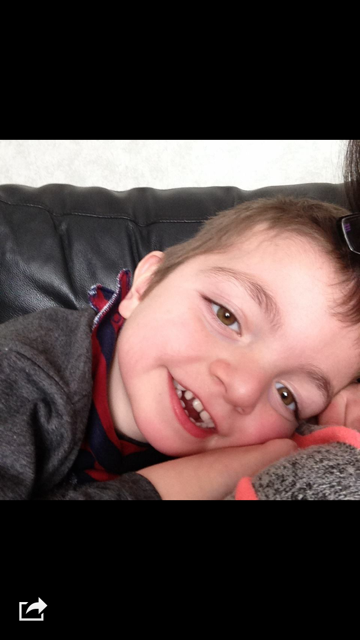 All that he was diagnosed with was Global developmental delay, hypermobility and a probable genetic disorder. Oscar was still eating puree foods at 18 months, he couldn’t grasp the idea of eating and would choke on anything lumpy. He had only just learnt to roll onto his side and was still only sitting with support. 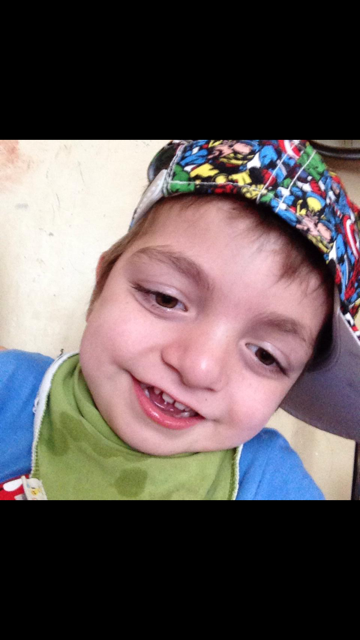 He was diagnosed with an atrial septal defect and had impaired vision due to slow sight maturity. His developmental profile put him at 6 months old. Oscar was still extremely clingy to me, he still wouldn’t sleep at night for more than a couple of hours and he was very tactile defensive. Oscar didn’t start walking until he was 2 years 9 months old. We finally got a call from his geneticist September 2013. Without much hope we had previously agreed to enter his details into a Genetic testing study but they had actually found a result. 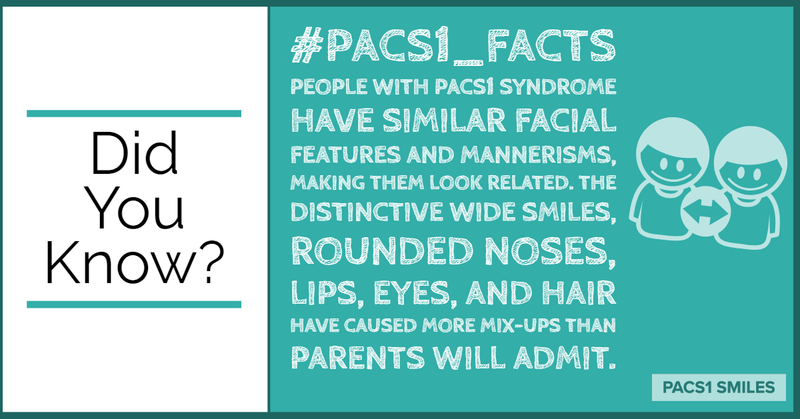 Oscar was diagnosed with the PACS1 gene mutation. Now Oscar is 5 years 8 months old. 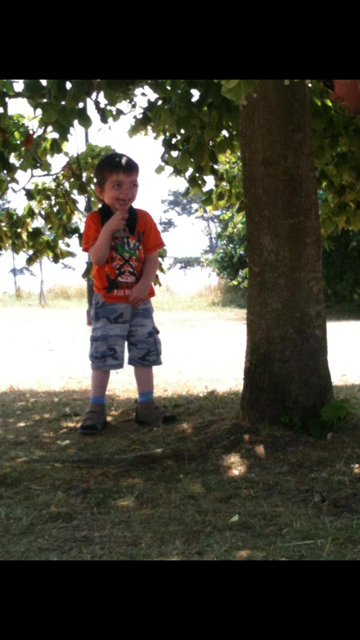 He is non verbal and attends a special needs school. He has behavioral problems and sensory processing disorder. 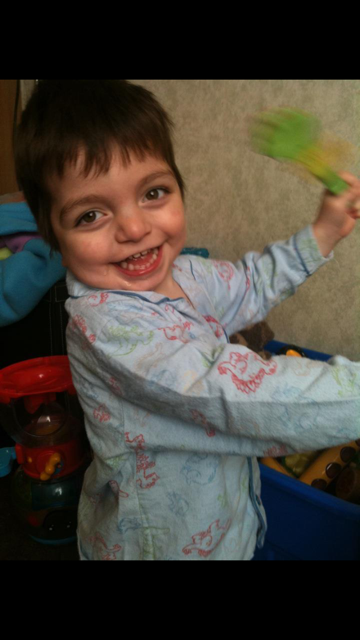 We still attend numerous hospital appointments and he is still receiving various treatments but his gorgeous smile and cheeky attitude makes it all worth while. We are now in contact with the other families of PACS1 children around the world which has made a huge difference, we can support each other and have learnt so much!